Happy Mother's Day to all you Mommies out there! Mother's Day just reminds me of going to my Mom's Group back when Darcy was still so tiny. The moderator warned us to have low expectations because our husbands might not understand just how important Mother's Day is to us Mommies. So what did I ask my husband for? Sleep. All I want is for him to take Darcy in the morning so I can sleep in for even half an hour! I'll let you know next week if he grants my wish. Vasanti of Signature Concoctions included Rachael Ray's recipe for Asparagus Prosciutto Wraps in her spring fling with asparagus. Food Network Humor analyzes the many faces of Rachael Ray. Kristin of Sogkonnite Living made Horseradish Beef Strudel from the April 2009 issue of Everyday with Rachael Ray. Emily of Emily Eats was inspired by a Rachael Ray recipe to create Butternut Harvest Soup with Cinnamon and Chipotle. Ty's Mommy of The Seventh Level of Boredom made One-Pot Ginger Chicken, Bok Choy and Couscous. Do you think that recipe would work with chicken breasts instead of thighs? Cyndi of Cookin' with Cyndi made Chicken Marsala Casserole, adapted from a recipe in Every Day with Rachael Ray. Lauralop of Edible Ventures adapted a Rachael Ray recipe to create Turkey Sausage and Zucchini Rice. Amybyrd of Life in the Junction made Strip Loin Steaks with Pizza Topping. Matt of No Meat Athlete adapted a Rachael Ray recipe to make it meat free: Warm Orange-Fennel-Olive Salad with Grilled Tempeh. Jen of Parenthetical discusses why she is a Rachael Ray fan. 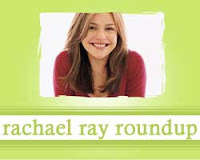 Rachael Ray comes in third in a Parentdish poll about celebrity babysitters. Vegetarian Mamma made Tomato Basil Panzanella. Sook of My Fabulous Recipes made Barbecued Chinese Chicken Lettuce Wraps. A Los Gatos man shares his experience on Rachael's talk show. Donna of My Tasty Treasures made Peas with Onions and Bacon. Thanks for the shout out! The meatless warm orange-fennel-olive salad turned out wonderfully. This is a fun site! I'm a huge fan of Rachael's recipes. Thank you for referencing me in your post. Wish you a Happy Mother's day! !